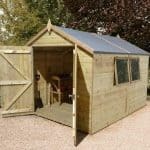 The top quality Treetops Traditional Pent Tool Store Shed is an excellent place to store your expensive garden tools and equipment. Built with brilliant security in mind, this windowless building comes complete with a lock and key. There are several models available and this is the medium size option, designed to hold slightly larger tools and equipment than the 5’x3’ model. What really causes this tool shed to stand out from the competition is its interchangeable panel design. This shed gives you the ability to choose where you would like the door. You can even upgrade to a double, rather than a single door. Whichever option you choose, you’re given an excellent amount of entry space; allowing you to store bulky equipment. Its tongue and groove build is featured throughout the entire building, rather than just the walls. This isn’t something you find with most value sheds and it makes a massive difference to what you can store. The great pent roof makes it great for installing onto the side of your home, or in front of a fence. Everything about this little building is created with top notch quality. 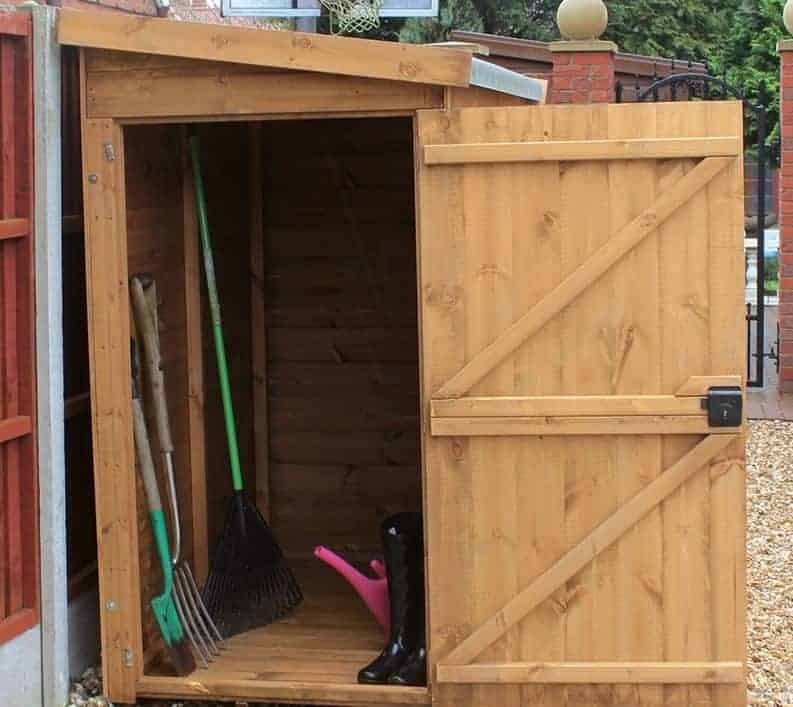 Guaranteed to keep your belongings safe all year round, you will struggle to find a better tool shed anywhere else. Does need annual treatments, though these aren’t very expensive. This durable, tough tool shed is part of the Treetops Traditional range and it offers a medium level of space to store important, valuable equipment. As you can see, it isn’t designed to be a walk-in building. You will find the majority of your tools can be reached right from the doorway. However, what is great about this sheds specifications is the width of the door. It is wider than most doors which not only offers great access, but also an excellent level of light so you can see exactly what you’re looking for. Created from 12mm tongue and groove, the roof and floor benefit from almost the exact same benefits as the external walls. Unlike solid sheet materials, tongue and groove construction really enhances the sheds durability and it can hold pretty heavy storage. It also ensures that the entire building is more structurally secure. Even the heaviest winds and downpours will be no match for this sturdy building. The roof has a popular pent design which enhances where you can install the shed. You can install it against buildings, under low hanging trees or in front of fences. It offers fantastic water drainage, though we do recommend upgrading the mineral felt included. One thing that is worth pointing out is that on the picture the shed is shown with floor bearers. You actually have to pay extra for these and they do not come as standard. More information can be found under the customisation options and extras section of the review. 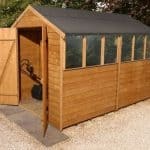 This exquisite tool shed is built from exclusive high quality Deal Redwood. It is PAR finished Shiplap tongue and groove cladding that provides an outstanding durability. Shiplap is the best quality cladding available and it offers an excellent level of natural water resistance. The main highlights of Shiplap and tongue and groove cladding include an interlocking finish, channelled panels which help to drain water away from the walls and a stylish, smooth finish. The cladding measures 12mm thick and will keep your tools dry and fully protected all year round. The frame is also thicker than standard, measuring an incredible 44mm x27mm. Inside there are chamfered edges, which basically means they are rounded. This stops the risk of splinters and creates a more seamless look. As it has only been basecoat treated, the manufacturer does recommend treating the shed within 6 weeks of assembly. You will also need to apply annual treatments too. The door of this tool shed is actually one of its most prominent features. As sold, the building comes with a single door which can be added the way it is seen in the photo, or on the opposite gable. Or you can also choose a double door design. More about these can be found under the customisation options and extras. The design of the door is also pretty great. Not only is it braced for added strength, but it also has a really wide design, giving you awesome access into the shed. It comes with a windowless build to ensure both privacy and security. This little, durable shed offers outstanding security and privacy. Most notably, it comes with a built in key operated lock. 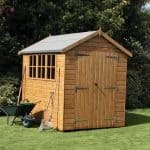 For a shed of this size and at such a low cost, this is an extremely impressive benefit. You won’t have to spend any additional money on security. The cladding is also secure as its thickness prevents even a crowbar getting through it. As the shed is also windowless, it offers the maximum amount of privacy any building can give you. So whatever you choose to store, you can rest in the knowledge that it won’t be seen by passers-by. There are three fantastic customisation options and extras on offer. The first and most impressive is the door selection. The single door can be placed exactly how it is shown on the picture, or it can be moved to the opposite gable. Both of these options are totally free. Another option is double doors. These would be placed on the low side of the shed and would offer a unique appearance. Access wise, due to the width of the single door, there isn’t much difference if you choose the double door option. So it would largely be down to personal preference rather than practicality benefits. The double doors do come at an extra cost. Floor bearers are one extra we do recommend. These are also shown on the picture, but you do need to pay more for them. Despite their small size, these bearers help to really lift the shed off the floor, allowing it to receive great ventilation, preventing rot and fungus. Finally there’s an installation service available. Though this will obviously save you time and stress, the tool shed isn’t exactly huge. Therefore it isn’t difficult to assemble yourself. 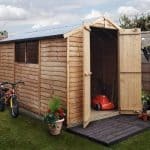 This is one of the most superior quality tool sheds we’ve reviewed. The Redwood timber really sets it apart, giving it a beautiful and sturdy finish. Even the interior and the door have been created to the very highest of standards. This tough small shed is designed to really last. If it didn’t need annual treatments it would have received a perfect 10/10 rating. 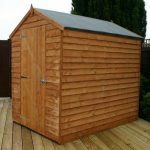 The Shiplap exterior walls and the tough tongue and groove roof and floor really ensure the shed is naturally water-resistant and capable of putting up with everyday wear and tear. You aren’t going to be able to cram a lot of large tools and equipment into the shed. However, there are larger sizes available. This one is designed mainly for smaller gardens which don’t have much storage space to work with. It will still hold all of your gardening essentials and thanks to its height and rigidity, it will also hold tall, heavy tools. You can choose to install this building yourself or pay for the professional garden building installation service. If you do choose the self-assembly option then you’ll be pleased to know it is pretty simple and quick to erect. The manufacturer states it will take from 2-4 hours to put together and with no windows to worry about, the assembly is really straight forward. This tool shed gives you magnificent value for money. Its incredible quality design, packed with excellent security really offers a long-lasting, safe place to store your valuable tools. Final Thoughts: It’s easy to see why so many customers love the Treetops Traditional Pent Tool Store Shed. This tough little building has a fantastically tough finish that is guaranteed to withstand all weather conditions when treated annually. The door choices available really make this one of the most unique tool sheds on the market. It comes with so many great features that it’s hard to believe the building is so affordable. We’d recommend adding the floor bearers as an extra, as this will help to protect the floor from fungus and rot. 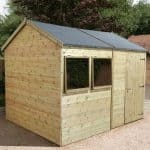 All in all we definitely recommend this windowless shed and are surprised by how affordable it is.